LAS VEGAS, Feb. 16, 2017 – Akash Modi of Morganville, N.J./Stanford University posted the top score in the all-around after the second of two preliminary sessions on the opening day of competition at the Winter Cup Challenge at Westgate Las Vegas Resort. Competition concludes Saturday at 10 p.m. ET with the finals, which will be webcast live at WinterCup.com/live. 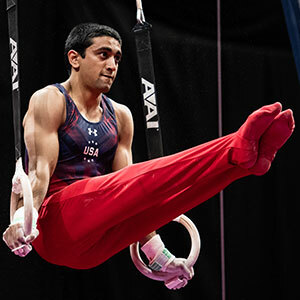 Modi leads the combined, two-session standings with an 86.300 behind event scores of 14.550, floor exercise; 13.900, pommel horse; 14.100, still rings; 14.500; vault; 14.850, parallel bars; 14.400, horizontal bar. Yul Moldauer of Arvada, Colo., and Allan Bower of Mesa, Ariz., both of whom train at the University of Oklahoma, are currently tied for second place with matching 84.850 totals. In the first session, Brandon Briones of Gilbert, Ariz./USA Youth Fitness posted scores of 13.900, floor, 12.550, pommel horse, 13.600, still rings, 14.250, vault, 13.300, parallel bars, and 13.100, horizontal bar, for an 80.750 total in the all-around. Hunter Justus of Cypress, Texas/University of Oklahoma, 80.700, and Johnny Jacobson of Syracuse, Utah/University of Illinois, 78.400, rounded out the top three. 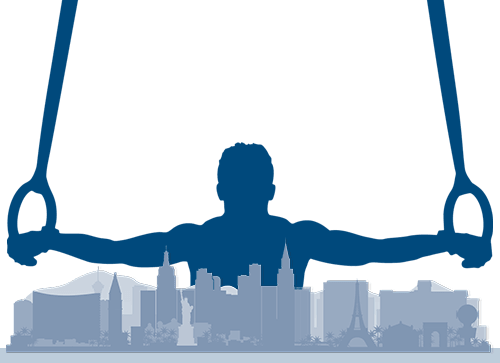 Two-time Olympian and four-time U.S. champion Sam Mikulak of Newport Beach, Calif./U.S. Olympic Training Center, suffered an injury in his first rotation on the floor exercise and could not continue to compete. The initial diagnosis is an Achilles tendon injury.